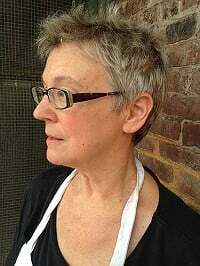 Joyce Garner is a self-taught painter and native Kentuckian, born in Covington with deeper roots in Laurel County. Contemporary influences are Grace Hartigan, Paula Rego, Juan Muñoz, and Roy DeForest. Garner’s ongoing “Table Series” is an extended allegory of people coming together around a table. Her canvases, typically 6 to 18 feet, are monumental, animated, dynamic, layered: appropriately scaled and complicated for the theme of power relations between people. Helpful figures of speech: get everyone around the table, turn the table, wait on tables, get a seat at the table, set the table, put something on the table (or take it off), lay one’s cards on the table, under the table. Also: take a back seat, grab a chair/grab a seat, in the catbird seat, the driver’s seat, the hot seat, on the edge of one’s seat, ringside seat, to fly by the seat of one’s pants. Garner also owns a contemporary gallery in Louisville, Kentucky. As a hobby, she renovates century-old commercial buildings.